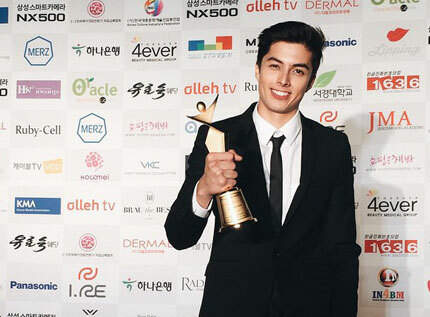 It was after he won Mr. Southville International School and Colleges (SISC) that alumnus LA Aguinaldo’s modeling career began. A modeling agent approached him after the pageant and offered him a modeling contract. Soon, the modeling agency sent LA’s portfolio to clients, and he started doing commercials in his free time or in between classes. LA thought that modeling is a good outlet to relax, hence, his decision to be a full-time model after college. Diverting all of his energy and time to modeling, the craft became LA’s passion. “I fixed my lifestyle. I went to bed earlier, ate healthier, and focused more on fitness and well-being. I wanted to become the best model out there,” LA shared in an interview. Modeling changed LA’s life. It helped him become a more confident and disciplined person. “I was a very shy boy, but modeling taught me to be comfortable with myself. I was able to enjoy life more and be open to possibilities.” Aside from personal transformations, modeling gave LA opportunities to meet the coolest people and go to the most amazing places. For LA, there is no dream that is too big. “In my head, I wanted this, I wanted that. So I told myself that I will do all it takes to achieve them. You see, if you tell yourself that you want to achieve something, you have a goal in mind that you want to accomplish. You will unconsciously do things to achieve those dreams. That’s why I’m not so scared to dream so big. I know that anything is possible,” he said. In the recent 2015 Asia Model Festival, LA was awarded Asia Star Model along with other supermodels from nineteen countries such China, Hong Kong, Mongolia, Japan, and Thailand. Garnering the most number of votes on the Asia Model Festival website, he was hailed Asia’s Favorite Model out of all the awardees. Going back to his student days at Southville, LA showed a positive reception towards the way Southville balances student life. “We learn not only from general subjects but also from extra-curricular activities. I loved learning Chinese and working on the lab for Chem class, and then prepare for a play all on the same day.” LA also expressed appreciation for the varsity training he had, as well as his VAT classes which allowed him to get extra study time in the morning before school started. “The SISC curriculum is definitely world-class,” he said. Carrying the light of a true Southville Monarch, LA Aguinaldo’s star truly shines the brightest.